Cheers to 2017…18 days later!! Well, I do have an idea though…that’s dangerous! So onto this new year with not only the things I love to bake, but to challenge myself on things I normally don’t bake, like cream puffs. I love these little guys, but never once have I tried it. Normally I back off from recipes that involve prepping from the stove top before the oven; I prefer the mixer. 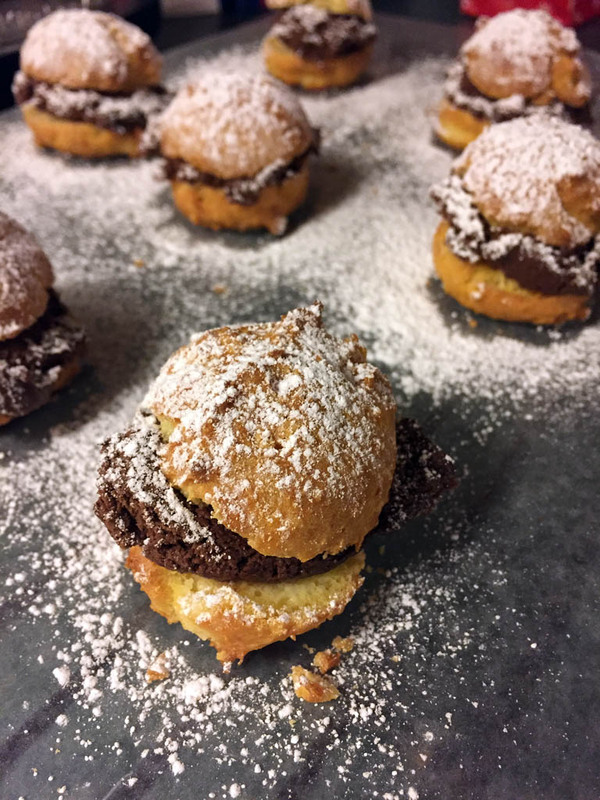 This time, one of my resolutions for 2017 is to try new things and give recipes I normally won’t do a chance, so okay, let’s try out these cream puffs. What I love about these is the filling. Instant chocolate pudding is what’s used in the original recipe, but instead, I went for a chocolate whipped frosting. I’m a frosting fiend; I could live on it! Using whipped is better than using a regular type of frosting because it’s got a lighter, smoother taste and texture, which work pretty good with these puffs. To fill the puffs I used a disposable frosting bag and a tip with a filling tip. 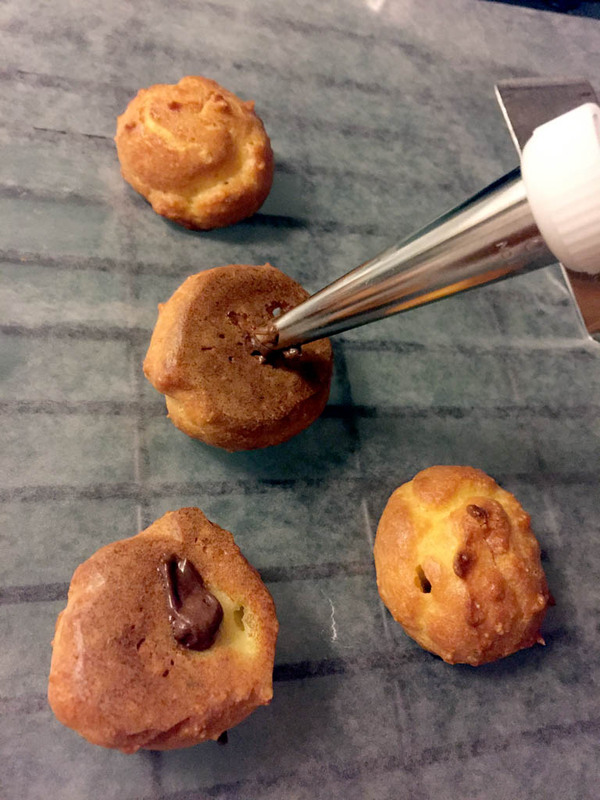 I carefully inserted the tip into the puff and squeezed a small amount of frosting inside. Be careful not to overfill; you can break your puff! 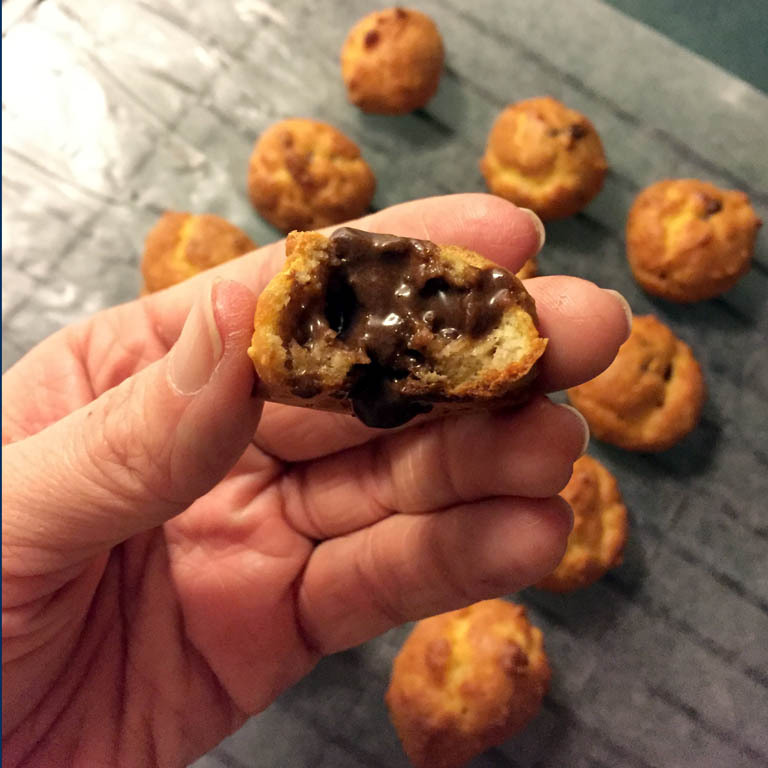 But if you make larger puffs you can cut them up in half and dab a nice helping of frosting on one side and smoosh ’em back together…oh yeah, much better! Once finished these bite-sized treats are so nice and powdery on the outside and chocolatey on the inside, you can’t just have one! So with these I’d say use whatever filling you prefer: frosting or pudding, they’re both just as good! • Heat water and margarine to a boil in a 2-quart saucepan. Add Bisquick all at once. Stir over low heat until mixture forms a ball. Remove from the heat; beat in the eggs one at a time. Place pan back on the heat and stir until smooth. 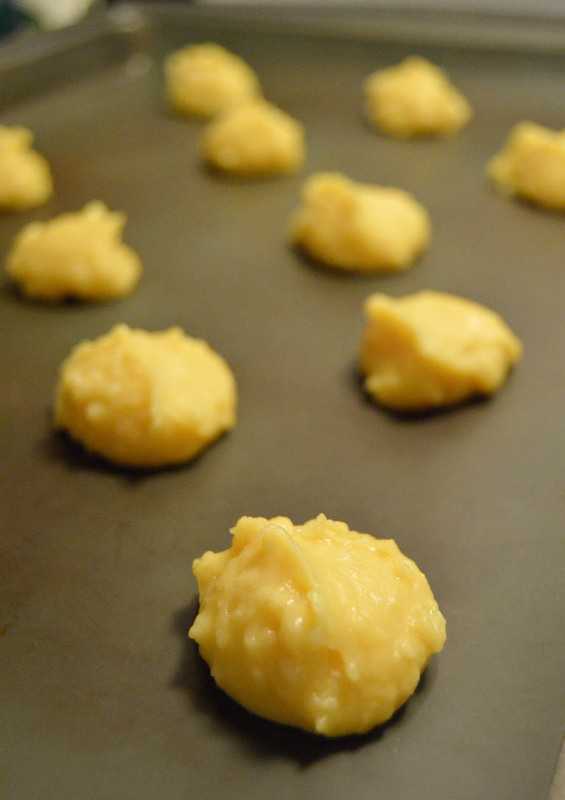 • Drop dough by rounded teaspoons or tablespoons onto cookie sheet. Bake until puffed (25-30 minutes). Cut small slit in each puff to allow steam to escape. Allow to cool completely. • Take a frosting bag with filling tip and fill with whipped frosting of your choice. Insert tip into the puff, and carefully squeeze the frosting inside. 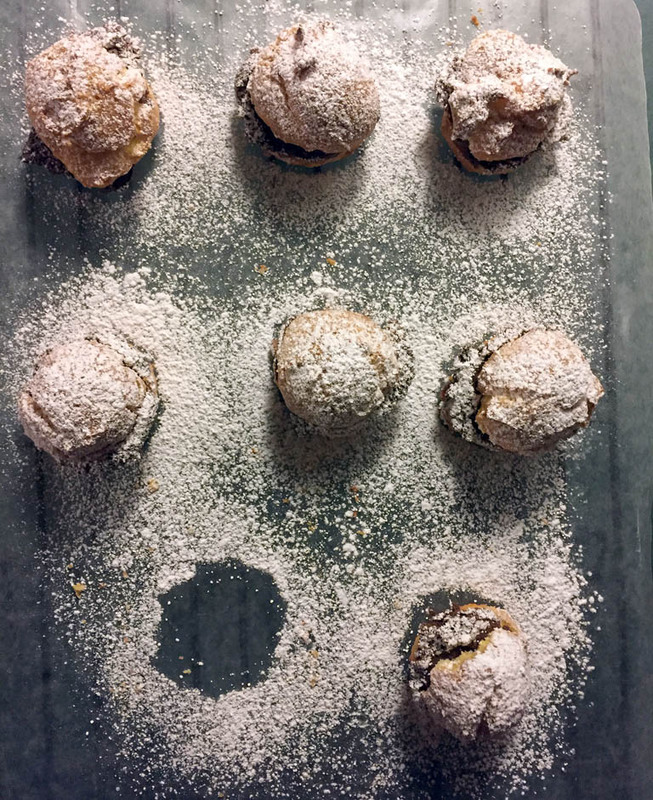 Sprinkle powdered sugar over top each puff. 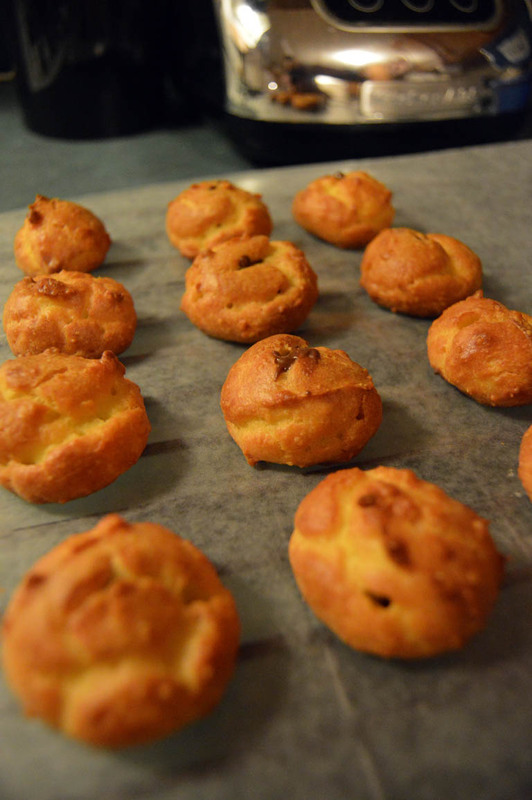 You can also cut each puff in half, spread one side with a heaping amount of frosting, and place back together. *If you’re unsure how to prep a disposable frosting bag with a decorating tip, step this way! She shows you how to prep with royal frosting, but you can do it with regular frosting too. It helped me! < Previous Mini Walnut Pies – And Pretzel Pies Too!